Hazel is supposed to be dead. When she lived before, she didn’t do a very good job of it. Sure, she was an obedient daughter, even when her mother was possessed by greed. But that was the problem – when the Voice took over her mother and commanded Hazel to use her “gift” for and evil purpose, Hazel couldn’t say no. Now because of her mistake, the future of the world is at risk. Hazel wished she could ride away from it all on the stallion that appears in her dreams. Frank is a klutz. His grandmother says he is descended from heroes and can be anything he wants to be, but he doesn’t see it. He doesn’t even know who his father is. He keeps hoping Apollo will claim him, because the only thing he is good at is archery – although not good enough to win camp war games. His bulky physique makes him feel like an ox, especially infront of Hazel, his closest friend at camp. He trusts her completely – enough to share the secret he holds close to his heart. Although I enjoyed The Lost Hero (review here) Percy was a sorely missed presence and I am so glad that he is back! However, all is not well with Percy Jackson. His memories have gone and he has being thrust into a strange Roman half-blood camp. Luckily for Percy, he befriends two Roman half-bloods. Hazel, daughter of Pluto (Hades) who was brought back from the dead by Nico de Angelo and Frank, son of Mars (Ares) who relies on a piece of wood to keep him alive – if the wood burns up, Frank dies. When Mars claims Frank as his son he sents Percy, Frank and Hazel on a quest to free Thanatos, the God of Death in the Land beyond the Gods (Alaska). So Percy and his friends go off on a quest, facing dangers, adventures and also trying to figure out the mystery of Percy’s old life. I absolutely loved The Son of Neptune. It was a great sequel to The Lost Hero and left on a great cliffhanger for The Mark of Athena, which I am so excited for. Although again I felt the book was a tad too long for the plot, I really loved the third person narrative and getting to know Frank and Hazel as characters and how they relate to the new prophecy. 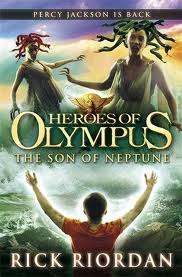 The Son of Neptune has got all the ingredients of a Riordan novel – adventure, danger, seriously surprising cliffhangers, great characters and a dash of romance. I cannot wait till October when The Mark of Athena gets released.